Published February 19th, 2017 / by maurice / 1 Comment on Will Java EE 8 meet its schedule? What’s currently the scope of Java EE 8? Is the development of the various JSRs on track? During the half year since JavaOne, there could clearly be more activity detected than in the period before that, when work seemed all but abandoned for most JSRs. But is this sufficient to meet the deadline? Not a single ‘final draft’ is published, so none of the standards will be finished early. JSON-B seems to be in the best shape, the ballot for the ‘public review’ was passed successfully in August. JSON-P, JSF and CDI have just entered the ‘public review’ period, and the remaining five are at some point of the ‘early drafts’ stage. 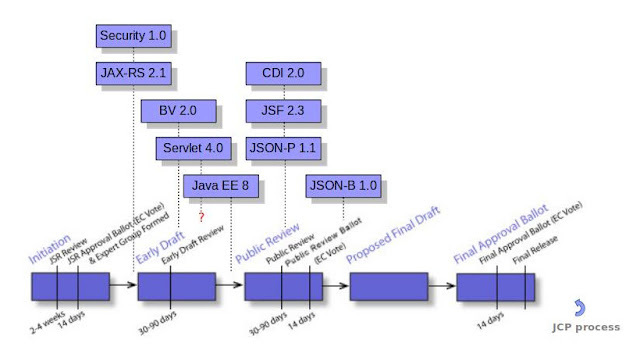 It seems that there is plenty of work to be done to make sure that all of the nine JSRs that make up Java EE 8 will be ready for a ‘final release’ before the end of the year. So, if you’re interested in helping out, go to your local JUG and join their Adopt-a-JSR program! If such a program is not in place yet, help them get one started! Oh, and if you happen to be living in the Netherlands: contact us at jcp@nljug.org, and we’ll assist you in getting your contributions where they count!